If going to work aboard a boat that cruise along the many Khlongs gives you a feeling of being one with nature, then you’ll be happier because Bangkok officials are planning to launch environmentally-friendly boats next month. 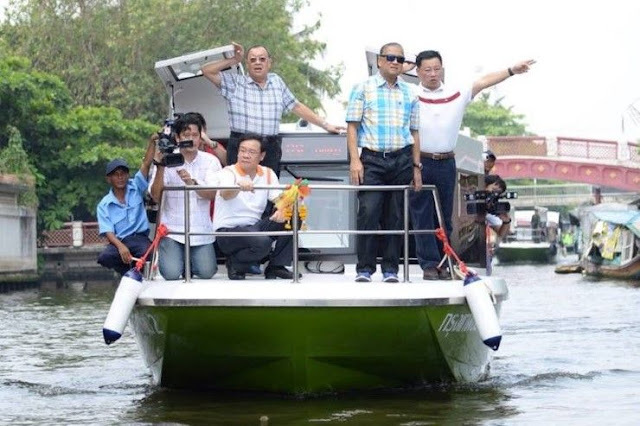 Coconuts Bangkok reported that Governor Sukhumbhand Paribata and Bangkok Metropolitan officials attended a test run of the boat prototypes, inspecting the 8km waterway connecting the Saphan Taksin pier with the pier at Taling Chan district’s floating market. The boats which will be deployed along the Khlong Phasi Charoen will have a capacity of 60 passengers. They are made of fiberglass and are equipped with a GPS automatic speed control system, four CCTV cameras and free Wi-Fi. The BMA is currently taining staff and testing three boats, before a further nine boats are delivered by the manufacturer in August. If all goes well, boats will be connected with BTS Sky Train Stations, too.